A giant dark hole has appeared on the sun’s flaming surface, a recently-taken NASA picture has revealed. So far, scientists are stumped by why this spectacular phenomenon, known as a “coronal hole,” occurs. “The Sun starts 2015 with an enormous coronal hole near the South Pole,” scientists of NASA’s Solar Dynamics Observatory wrote in their blog, having posted a picture of the flaming sun with a gaping dark space in its lower part. READ MORE: Spectacular space: The most stunning, mind-boggling photos & videos of 2014! What modern science knows is that “coronal holes” are places where particles leave the sun’s surface at huge speeds - of up to 500 miles per hour (800 kilometers per hour). What’s still unclear is why this is happening. The first pictures of the phenomenon were taken by NASA astronauts in the early 1970s. 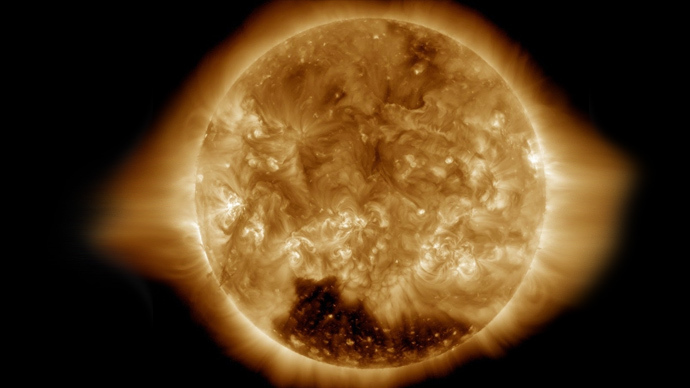 The coronal holes on the sun’s poles may be seen for five or more years. Their shape can vary greatly, though. It’s assumed that high-speed winds of solar particles coming out of the sun’s dark holes can cause geomagnetic storms and auroras on Earth. NASA's Solar Dynamics Observatory (SDO), which detected the latest coronal hole, participated late last year in the creation of one of the most impressive images of the sun ever. SDO’s picture was then combined with a photo of the sun’s X-ray emissions taken by NASA’s Nuclear Spectroscopic Telescope Array. In October 2014, just before Halloween, NASA took a photo of the sun resembling a jack-o'-lantern. The storms and flares on the surface of the sun actually gave a carved pumpkin appearance to the sun, as seen from the Earth.